Build Your Own Bleachers and Benches from Bison offer an affordable option, saving your program up to 30 percent, for quality player and spectator seating. You pay shipping on just the galvanized steel structure and hardware, and then purchase lumber locally. Three-tier and four-tier bleacher models are available, as well as a portable player bench with back. Bison also manufactures traditional bleachers and benches. Perma-Cap® vinyl bleacher refurbishment covers are engineered to maintain their color fastness and impact-resistant properties over years of outdoor exposure. A good insulator, Perma-Cap won't draw heat from your body the way aluminum does—adding comfort to existing aluminum grandstands. Perma-Cap also eliminates the costly maintenance, refinishing or replacement of indoor wood bleachers. Indoors or out, Perma-Cap's simple installation and vibrant color palette easily enhance school spirit while prolonging your infrastructure investment. Southern Bleacher's angle frame bleachers exemplify the many features sought by quality- and safety-conscious owners. 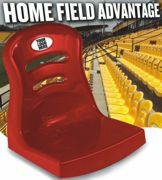 They are the most cost-effective way to obtain seating for your track, field or court. The angle frame bleachers come in several choices of row count and length. Southern Bleacher can readily customize angle frame bleachers with vertical picket railing, aluminum backrest and stadium chairs. Speedy Bleacher 108 is an economical folding and highway-towable, versatile seating solution. It seats 108 people and has both an aisle and a handrail. It is easily moved from one field to another with a conventional vehicle. Complete with a battery electric folding mechanism and telescoping tongue, it can easily be put where it is needed in just a few minutes by one person. It is more economical than having permanent bleachers at every location that sit empty most of the year. BleaChair is a permanent or temporary seat back upgrade for existing bleacher seating, available in four sizes to fit any bleacher and in six standard UV-resistant colors. The BleaChair increases comfort, adds color and creates a clearly defined seat space, all at a cost-effective price. They can be used as a fundraiser by utilizing the sponsorship ovals on each side of the chair. Tip N'Roll Bleachers are the perfect solution to your auxiliary seating needs. The Tip N'Roll bleachers are easily tipped up onto swivel casters for movement. Caster brakes keep the bleacher from rolling when stored. Tip N'Roll bleachers can be supplied with single or double foot planks. Since all two- and three-row Tip N'Roll models are less than 30 inches high, most codes do not require guard rails. Four-row bleacher is also available.